Lewis Hamilton is expecting the Singapore Grand Prix to be a three-way fight between his Mercedes team, the Ferraris and Red Bulls. 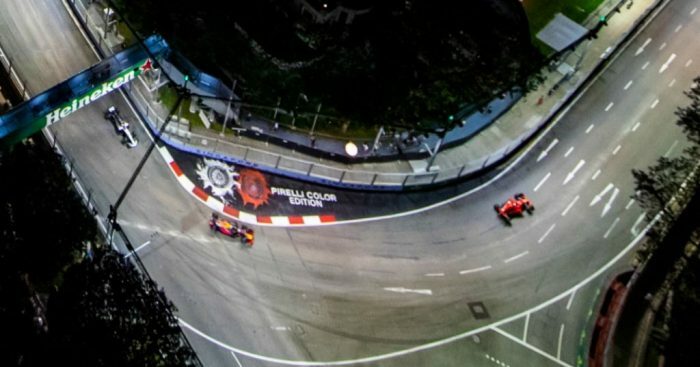 The Marina Bay Circuit is one where the Mercedes are not usually at their strongest, but they got the win last year after the Turn 1 collision which took Kimi Raikkonen, Max Verstappen and Sebastian Vettel out of the race. This time, though, the Silver Arrows seem to have the pace, with Hamilton just 0.011s slower than Raikkonen in FP2. “It’s looking like it might be a three-way fight between Ferrari, Red Bull and us,” Hamilton said. The Brit was not so quick in the opening session of the weekend, with the Renault of Nico Hulkenberg managing to get ahead of his time in FP1. Despite the P6 finish in first practice, Hamilton said that the times showed a different story. “The first session of the day was good, even though it might not show on the time sheets as we didn’t use the hypersoft tyres,” he added. The Mercedes 2018 challenger is significantly better around the streets of Singapore compared to last year’s car, thats according to the four-time World Champion. “The guys have been working so hard both here at the track and back at the factory to improve the car and it is definitely feeling better than it did in the past,” Hamilton said. Team-mate Valtteri Bottas struggled around the Marina Bay circuit on Friday, with P8 and P5 finishes in the two practice sessions. The Finn believes that the team have made improvements since last year, but claims it is difficult to get it right on a lap in Singapore. “FP1 already looked a bit better than last year. In FP2, both Ferrari and Red Bull looked very quick, but we were not far off,” Bottas said. “The car has been improved massively in the high-downforce trim. It is much quicker, even compared to the beginning of the season. “It’s extremely difficult to get the balance perfectly right on this circuit, there’s such a wide range of corners, so we have a lot of work to do. Follow updates and live timings from the Singapore Grand Prix with the PlanetF1 race hub.